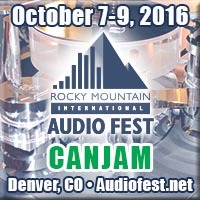 Update 2 Nov 2017: AudioXpress has placed my AX T-Reg article online. Thank you Editor-in-Chief João Martins! 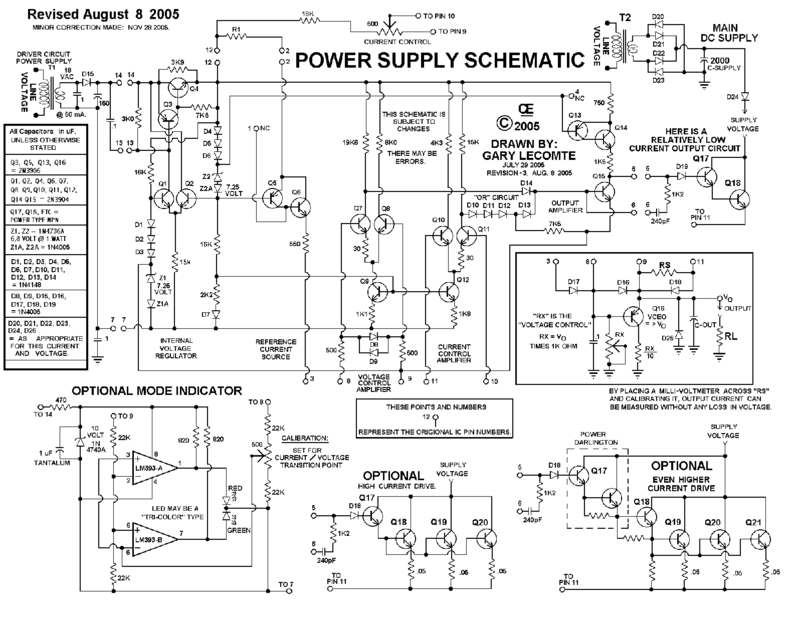 This is a project for a high-voltage regulator for tube amplifiers. The design will provide anything from 50V to 500V DC and more at up to 1A DC. The tube on the assembly in the picture is an EL84 for the preamp 50mA max version. The large 6528 plug-in will provide up to 500mA. The MOSFET regulator plug-in can handle up to 1A output current. 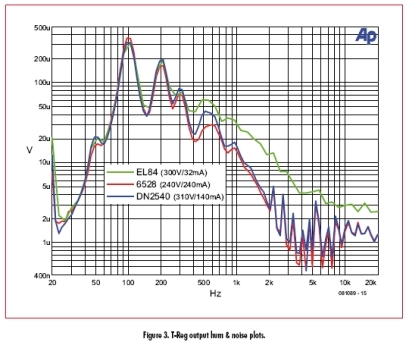 Measurements show low output impedance of less than 100mOhms, and hum and noise below 300uV, all over the audio bandwidth. Not bad for a tube supply, and no opamps! I have updated the article but it has not been published. Several people asked me about a PCB for the updated design, but only a few have been produced. To accomodate interest, I have decided to publish the article and the PCB Gerber files here so people can have their own PCB manufactured and/or organise a Group Buy at diyaudio. Here's a color rendition of the layout showing a few SMDcaps at the solder side. Of interest: I received a message from Jacques Dehaye from France, with a link to "The American Electricians Handbook". 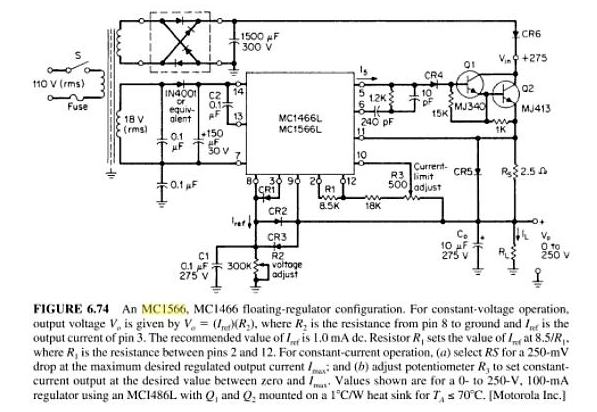 This book has a Motorola app note for an MC1466L and its cousin, the MC1566L.This is a clear diagram explaining the operation of the floating regulator. Thank you Jacques! Also, John Walton alerted me that resistors R3 and R5 should be able to handle high voltage, up to 500V. These are available from the usual sources like Farnell and RS Components, from Multicomp and Vishay. Alternatively, you could make up R3 and R5 from two resistors in series of half the total value. Stop press! There is an error on the DN2540 plug-in board available through Elektor. One end of R3 is going nowhere - this should be connected to K2. My apologies, it is entirely my fault. Thanks John Lopez! As noted, the T-reg is based on the MC1466L floating voltage/current reg chip, now obsolete. Interestingly, Gary Lecomte has developed a discrete version (pcb actually) of that MC1466L! (Thanks John O'Neill). One builder of the DN2540 version of T-reg had some problems with it and I discovered that it probably is related to (re)connecting a capacitive load with the regulator live. The pass device DN2540 has a max Id of only 500mA, which is sufficient for normal use but may be exceeded in some cases when (re)connecting a cap load. Elektor have published the design in the March 2009 issues of the NL and UK magazines. AudioXpress has published an adapted version in their April 2009 issue. The T-reg Stuffing Guides in the AX-article didn't come out very well so here are alternatives: Main board, 6080 board, EL84 board, DN2450 board.Boards for the original design may be obtained from Elektor through their PCB service - I have no more PCBs for this project available. Update May 2012: I have redesigned this regulator as a stand-alone board with only the regulator, no rectifier, no time delay. You input the raw rectified DC and a supply voltage for the control circuit, and out comes the regulated voltage. Also redesigned the unit for a 'regular' enhancement mode MOSFET, tested with an IRF740. Works well, almost unlimited current capability, with substantial the same specs as the old unit, with less mains breakthrough. Can be 'hot plugged' into a load with no problems. Update February 2013: I have submitted a follow-up article to Elektor, describing the new version which uses 'regular' power MOSFETs as pass devices. I expect Elektor to publish it later in 2013. This article also shows how to use a pos reg for a negative voltage and vice versa, which means that the DC supply for the control voltage no longer needs to float on Vout, but can be ground-referenced. Maximum input voltage: Be aware that the pass device you use must be able to withstand the full raw DC input voltage. Although in practical use the pass device will only see the Vin-Vout differential, this is not the case at the moment you connect a (capacitive) load to the regulator. The load represents a very short term short, until the caps start to charge. This can be enough to destroy a solid state pass device. Tube pass devices will most probably survive this, but you have been warned!